Mix maida, baking powder and water to make smooth dough. Leave the dough overnight. Roll out medium sized chapattis from dough. Cut into two halves from the middle like samosas. Now make a mixture of grated cabbage, onion, ginger paste and salt to taste to stuff in. Stuff the half-piece chapatti with this mixture. Repeat the step to make all the momos. Steam these momos in an idli utensil for about 10 minutes. Or you can also fry them. To prepare chutney, churn garlic, red chilli and vinegar in a mixer. 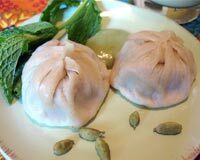 Serve the momos with chutney.